My kids are now into almost any food that makes them feel smart or strong. For example, if I put something like roast carrots on their plates and they linger uneaten, all I have to say is, "they'll help you see better," and they're gobbled up in a jiff. All too often, kids (and many adults) aren't aware of the important health benefits certain foods offer their bodies and minds. Yet when we start to understand the positive effects different foods have on our bodies, we tend to make better choices, and in many ways, start to enjoy eating more. We're big Greek yogurt eaters in my house. Greek yogurt is packed with protein, calcium and most contain natural probiotics which are great for our digestive health and can even boost our immune systems. Combine it with two other super foods like blueberries and walnuts, omega-3 and fiber-packed flax seeds, and a few other naturally sweet ingredients like apples and honey and you've got a true power breakfast that will give your body and mind a big boost first thing in the morning -- when you need it most. How smart do you feel now knowing that? 1. Place all ingredients in a bowl and stir to combine. We just finally made the switch to Greek Yogurt and I am so happy we have. We add a little honey to the Yogurt and use it as apple dipping sauce. 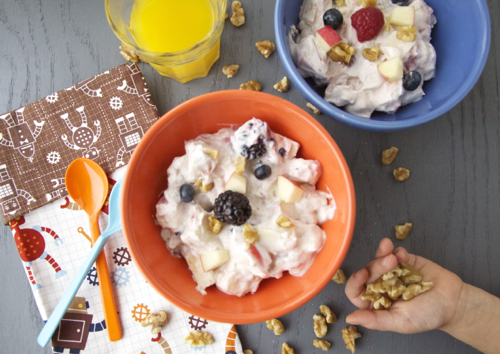 We make fruit salad with plain yogurt and cinnamon. It works great with regular plain organic yogurt (lowfat is fine) if you have that on hand rather than the greek style. Always delicious with any kind of fruit. This is pretty much my son's breakfast 5 days a week when we have to be out of the house by 630. But I also add some spinach, kale, or other vegetable to it also to get an extra serving in. On another note: I FINALLY bought the Weelicious cookbook, and my son, who is a self-imposed vegetarian, has been gobbling up everything! Last night he ate THREE turkey pesto (I used your kale pesto recipe. Going to try the broccoli one net time) meatballs. We are goin to try the tacitos tonigt. Thanks for wonderful recipes! My kids devoured this and I had all the ingredients on hand because we eat these kinds of thing all the time. It's nice to be able to throw them all together into one dish. Definitely adding this one to the weekly meal plan! I put everything in a blender and pureed it for my one-year-old (she still doesn't have many teeth, yet). She gobbled it up! I thought maybe my 2 1/2-year-old might like it this way, too, since he's finicky about chunks of food in his yogurt...not so. He prefers all his ingredients separate (although he eats smoothies just fine...hmmmm)! Oh well, at least he still likes to eat those things, even if they're not all mixed together. In any case, I LOVED it.....SO delicious!! I also like the fact that I don't have to worry about my breakfast getting cold while I attend to my little ones :) I can come back to it and it's still just as yummy! I don't have a little one old enough for this yet but it has become MY personal favorite over the last week. A perfect combo of favors and textures! Yummy! This is the perfect recipe. Delicious! This sounds so good, Catherine! Do you think pecans can still make it taste good? I'm not sure they have the same benefits that walnuts do, but I have some on-hand so I'll probably give it a try. So I had some walnuts, but they went bad pretty quickly. Any tips on keeping them fresh longer? Thanks! Store nuts in the freezer to extend their shelf life! Still use them within a month or two, though. You can use any nuts in this recipe and it will still be delicious! Contact Dr Raypower at [email protected] if you want to get your Husband, Wife, Boyfriend and Girlfriend back now and regain your happiness.